The operational headquarters of Telekom Malaysia Berhad has been awarded the MSC Malaysia Cybercentre status, and now known as TM Cybercentre Complex. This is an intelligent building situated on Jalan Pantai Baru, along the Federal Highway and SPRINT Expressway and is served by the Rapid KL Kerinchi LRT station. 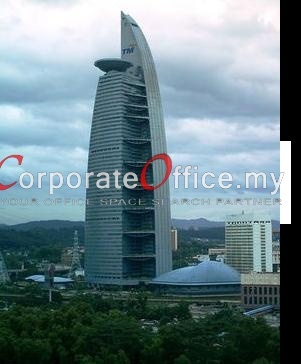 It is a prestigious office complex officially opened in February 2003. It offers advanced broadband facilities in addition to the state-of-the-art office environment. These added facilities are based on MSC Malaysia standards as stipulated by the Multimedia Development Corporation. The strategic location between KL & PJ provides another excellent alternative for MSC Malaysia Status companies who are looking for an unique corporate address in KL City. The location of this building is also near to many other MSC Malaysia status office buildings like KL Sentral, Mid Valley City & Bangsar South City. LIMITED office space is available for lease — Call us today at +6014-6262 623 or email us at info@CorporateOffice.my to book for a tour of the prestigious office development! No. 211, Jalan Tun Sambathan, Kuala Lumpur, Wilayah Persekutuan, 50470, Malaysia. Jalan Stesen Sentral 2, Kuala Lumpur, Kuala Lumpur, 57000, Malaysia.